American, Delta, JetBlue and United have all upgraded select hubs, making travel more tolerable. Most beautiful airports story updated with information about Miami International and San Francisco International's new Terminal 2, for which there will be a grand opening party Saturday. NEW YORK ( TheStreet) -- Airline travel can involve unpleasant moments, from going through security to waiting out bad weather to watching thoughtless passengers with too much baggage. One way airlines and airports can enhance the experience is by making terminals pleasant places to be. These are multibillion dollar projects that take many years, so they involve major bets on the economy. For airlines, it can be difficult to quantify the financial benefit, but it is easy to make the case that gorgeous terminals like American's ( AMR - Get Report) Terminal Eight at New York's Kennedy Airport provide a competitive advantage, given that international travelers in the New York area have a broad array of choices. Miami International is nearing the completion of a $6.4 billion overhaul. American Airlines' share is about 72%. Similarly, because it replaced an antiquated facility, JetBlue's ( JBLU - Get Report) Terminal Five at JFK vastly eased baggage handling and passenger traffic flow, making the operation far more efficient. Hub airports also complete with other airports for passengers who must connect, so Delta ( DAL - Get Report) and United ( UAL - Get Report) gain advantages from upgrades at Detroit and Houston. Read on for our choices for the nation's six most beautiful airport terminals. San Francisco International Airport's revamped Terminal 2 officially opened Wednesday, when Virgin Group founder Richard Branson and a handful of other celebrities arrived on a Virgin Airbus A320. The public grand opening is Saturday, and the first commercial flights are set to arrive Thursday, April 14. The newly-updated 640,000-square-foot "T2" is a major departure from the typical airport terminal, and features a focus on sustainability and traveler convenience and comfort. The $383 million overhaul includes white leather sofas, new-age egg-shaped chairs and a local food marketplace with offerings from organic food purveyors including celebrity chefs Tyler Florence and Cat Cora. Some 90% of the original building content was recycled. "We want to return the romance to travel, make it less stressful," airport spokesman Michael McCarron told The San Francisco Chronicle. "This is an elegant place." T-2 was originally constructed in 1954. 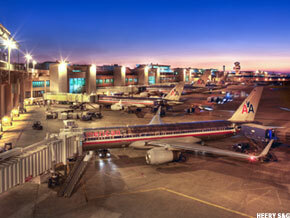 It served as the central terminal, showcasing the first jet bridge to the world and ushering in the modern jet age. One of its first tenants, American Airlines, utilized a prototype of the jet bridge for its aircraft. In 1984, T2 underwent its first renovation by current architect, Gensler, transforming the space into SFO's international terminal. Virgin America will occupy seven gates at the new T2, American Airlines will operate six and there will be one common-use gate. It cost too much and it took too long, but the renovation of Miami International Airport is finally nearing completion. The project began in 1995, billed as a $975 million new terminal for hub carrier American. The scope and the cost both swelled. American's terminal ended up costing $3 billion, while other improvements, including a new terminal for United and its partners, brought the total cost to $6.4 billion. In 2010, passenger traffic at MIA grew 5.0%, to reach 35.7 million, as carriers added eight new international destinations including Berlin, Brasilia (on two carriers) and Moscow. International traffic accounted for 17 million passengers, making MIA the country's second biggest international airport after New York Kennedy. This year, the Skyteam alliance is growing, with Delta adding daily service to London Heathrow while KLM begins four weekly flights to Amsterdam. Other carriers plan Amsterdam and Lisbon service. American opened its Kennedy terminal in August 2007. At an opening ceremony, CEO Gerard Arpey called the $1.3 billion terminal "one of the biggest, boldest and most expensive projects in American Airlines history." The airy, imposing structure has 65-foot ceilings, 84 staffed ticketing positions, three passenger lounges and 36 gates. Today, American and American Eagle offer 117 daily departures from JFK, making it a relatively small hub in terms of departures. But 31 of the destinations are international. The cornerstone is New York-London/Heathrow service, which, during the day, is nearly hourly, given that American is now able to coordinate schedules and pricing with partner British Airways. Other international destinations include Paris, Rome, Madrid, Zurich, Brussels, Buenos Aires, Rio, and Tokyo-Narita, with Tokyo-Haneda service planned. JetBlue opened its innovative $750 million Kennedy terminal in October 2008.. It includes 26 gates, 22 restaurants, two dozen retail outlets and up to 20 security lanes. The feel there is hip -- more so because JetBlue has offered T5 concerts by artists including Sarah McLachlan, Daughtry and acapella group Straight No Chaser, not to mention an October concert by Taylor Swift. From T5, JetBlue offers approximately 150 daily departures to 51 destinations. The number will increase to 52 when JetBlue begins Turks and Caicos service in February, and to 53 when summer Nantucket service is included. Of note: Delta realizes it needs a better terminal to compete at JFK, and has said it will spend $1.2 billion to expand its antiquated quarters. Northwest opened its $1.2 billion, 122-gate Detroit terminal in 2002, replacing an ancient facility. Passengers on other airlines use a second new terminal that opened in 2008. Following the 2008 merger with Northwest, Detroit became Delta's second largest hub. Today from Detroit, Delta offers 580 peak-day departures to 147 destinations, including 20 international destinations. Detroit is among the country's principal gateways to Asia, with non-stop flights to Hong Kong, Shanghai, Seoul, Tokyo-Narita and Nagoya. Additionally, Delta recently began service to Sao Paulo, the first non-stop flight between Detroit and South America, and plans to begin Tokyo-Haneda service in February. In Houston, Continental reopened the final phase of 23-gate Terminal E (above), which handles international flights, in 2004. It reopened Terminal C, primarily for domestic flights, in May 2010. The renovations cost $300 million and $65 million, respectively. Houston is the largest hub for the new United, with more than 45,000 passengers boarding each day, or 16.4 million each year. Like many modern terminals, including T5 at JFK, Houston's Terminal C (not pictured) does not include the traditional row of ticket counters positioned against a single wall, with travelers waiting in line for service. Rather, the terminal includes 115 check-in locations at check-in islands, including both kiosks and counters. Terminal C had not been upgraded since it opened in 1981.